I had been drinking plenty of water, so I knew heatstroke wasn’t causing me to hallucinate the words on the sign above the barn at the Indiana State Fair. 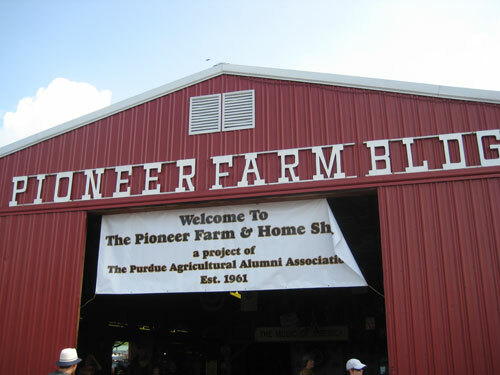 Pioneer Farm Blog? Huh? I stared at it for another 5 seconds and still couldn’t understand what the sign was supposed to say. A Pioneer Farm Blog? Here? Amongst the sheep and horses and pigs? Then finally I figured it out – Pioneer Farm Bldg. (short for “Building”). Good to know. Okay, I can’t stop laughing. Are we really using abbreviations on buildings now? Isn’t the “building” part just a given? And I can see why you were a might confused, of course I am the girl that used to think the ‘.9’ that follows the prices posted at gas stations was actually a little “g”, as in “$2.39 per gallon.” My husband still LOVES to remind me of that one 10 years later. Oh,thank goodness – I thought I was the only one who saw “BLOG” for a while, there. You know you’re a blogger when. . .you see the word “blog” everywhere! I am more intrigued by the cryptic Sh. Holy crap! This is so funny! The other day my roommate and I went to a movie and across the street from the theater was a sign that said, “Bldg for rent”. I said, “Blog for rent?” As in, blog for free rent! Or, I have a blog I’d like to rent out. My roommate has not let me forget what a complete Internet dork I am ever since. Awesome. Those darn Crazy lettering will get you sometime….. Mental note: Don’t drink water while reading one of your highly comical posts. I just spit out my water when I read this. Thanks for the laugh though! hahahahahahahaha! I needed that laugh today! We have a fair that has a building that reads Archery and Cat Barn. Might have come in handy for your next post. I saw BLOG when I looked at the picture too. It is only because we are bloggers that it stands out to us like that. I know I tend to notice people with the same color outfits on that I have more prominently each day. I am sure there is a psychological explanation for this sort of thing.